The coming New Moon on August 28, Washington DC is @ 5 degrees 27’ of the image of the Virgin, Virgo. The most interesting feature for the US is the fact that this new Moon will fall across the Paris Treaty charts Ascendant. 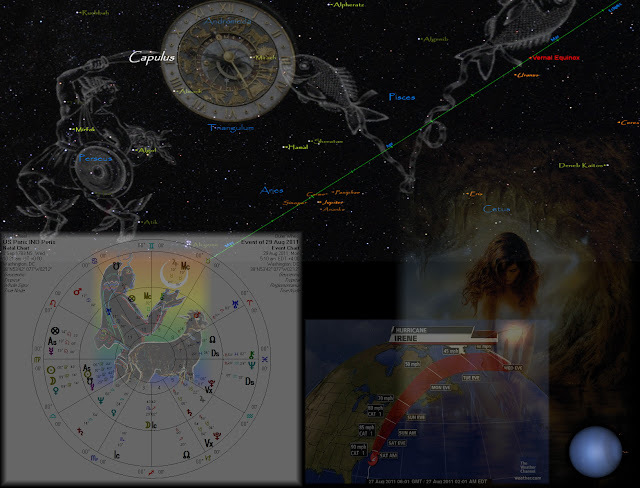 The other surprising feature is that when the chart is cast using Regiomontanus cusp, 24 degrees Taurus is rising. This hour-marker is the hand of Perseus, with the fixed star Capulus- M34, rising? Ok what’s so interesting about this star?? Well its link to events effecting large numbers of people, especially those of major meteorological occurrences. Now Venus is the lord of Taurus and Aphrodite is Depressed in (Fall) in Virgo in her own confines, trine to Jupiter. Now that seems ok, but Zeus is in the confines of Mercury, who is still inactive and as the Lord of the New Moon is idle. Hermes is unable to administer the affairs. The first aspect the New-Moon makes is to Venus and as so will enact her depression. The Moon rules the weather along with the 1st and 4th houses. The US Pairs Treaty chart has the natal moon at 29 degrees Scorpio, ruled by Mars. The 2010-11 PT solar return has return Moon at 00 degrees Cancer. The 227 profected year is the 12th house Leo, so the month lord for August is the natal 11th, which is ruled by the Moon. On the New Moon on the 28th August, transiting Neptune will be at 29 degrees Aquarius, exactly square to the natal Scorpio Moon. With Mars the lord in Cancer and the 28th profected day lord is Venus. So how’s that going to affect the US...well Capulus as the rising star for Washington has permanent curtailed passage. So is the Sky God Uranus along with Jupiter telling us something....as Hermes is idle...on August 29th @ 05:10hrs EDT, Washington DC, the transiting Moon will co-join transiting Venus. At this moment Mercury is rising......Jupiter is culminating and the IC is 10 Scorpio. The IC’s confine lord for this chart is Venus. During the coming week Times may seem tough! The planetary war rages on! The Greek theatre is playing. The Stars on stage this week are Ares, who is feeling quite down, miserable, despondent and confused. On Thursday August 25th, 2011, in the US as you awaken to the start of a new day Mars will be joined by the Moon and he will become emotional and morally disheartened. Mars is being challenged by the Lord of Karma Kronos, (Saturn). This will be a Time of deep reflection; money markets may be caught in this contest. Something has to revolutionize, transformation is inevitable as the 11th House, which represents the stock market and the 2nd and 8th houses are questioned. The Solider/Military, the warrior, all will be in a darken state as the light of the night shines dimly. This is a Time to Stand straight, upright and give your coins you saved to the ferrymen as the boat ride through the Gates of Hades has begun. Your emergence through the Gates of Ivory will be accomplishment if you surrender your soul to the Sea of Tranquillity! From the Light to the Dark and Back again! 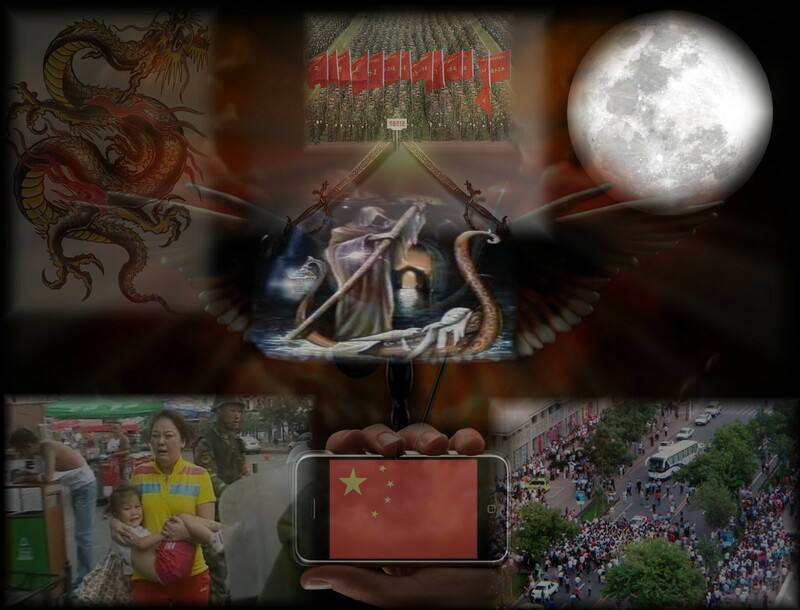 This coming week sees China on the rise...as the Astrological events trigger the 3rd-Ethnic neighbour’s 6th-Miltary/police/health and 9th- foreign affairs....houses of the Chinese national chart. The 12th house of secret affairs and plots will also be active. 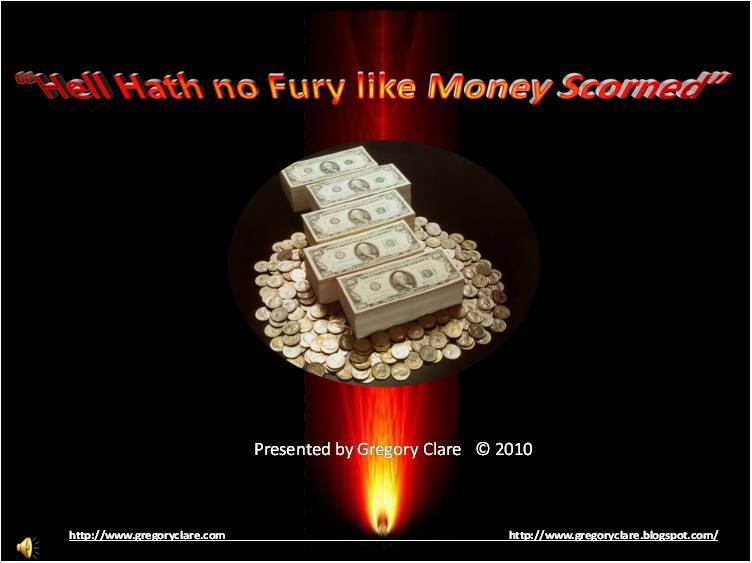 On or around August 10, 2011 Ares (Mars) takes on Hades (Pluto) who has the light of the Goat horned Moon/Selene.....with Uranus overseeing the brutal attempt to justifier ethnic cleansing. The Chinese US dialogue will be interesting to hear...as tensions rise with this coming Lunation lighting up the heavens...this lunation will be a test of the leaderships’ of both countries.